Dogs are carnivores and their metabolism is unchanged from the wolf. It isn't possible for a commercial food to contain the same elements as a natural, raw diet. A raw dog food diet refers to feeding your dog a diet which totally excludes all commercial type dog foods. Commercial dog foods containing grain and corn are not appropriate for the dog metabolism. Raw dog food is one of the best things you can do for your dog. Feeding your dog this kind of a diet will have many long-term health benefits, including cleaner, stronger teeth; fresher breath; a fuller, shinier coat; more energy and a better temperament. Not to mention the fact that your dog will have a much greater chance of avoiding things like diabetes, cancer, and auto immune disease. Making raw dog food is somewhat intimidating to some people. But, it's easier to get down to the local supermarket, pick up a bag of dry dog food and call it good. This, however, is like feeding your kids nothing but potato chips for breakfast lunch and dinner and calling it good nutrition! Making your own raw dog food doesn't have to be that difficult. 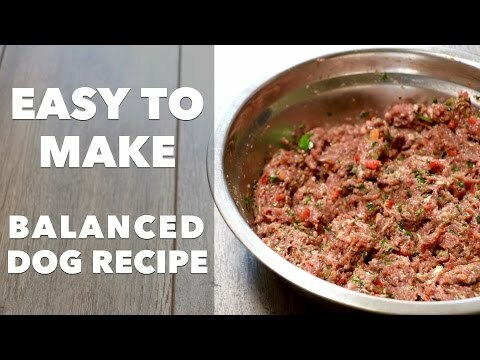 Following this video and you will be amazed how easy it is to make your raw dog food! DoglopedixDogs are carnivores and their metabolism is unchanged from the wolf. It isn't possible for a commercial food to contain the same elements as a natural, raw diet. A raw dog food diet refers to feeding your dog a diet which totally excludes all commercial type dog foods. Commercial dog foods containing grain and corn are not appropriate for the dog metabolism.